In this asana – one foot is extended up high, creating a splits-like action with the legs. There are certain words which seem to trigger fear in us when we hear them called out in a yoga class, and for most people, one of those words might just be ‘splits’. Hanumanasana – the Sanskrit word for the traditional splits position on the floor, refers to the monkey god Hanuman in the epic tale The Ramayana, as he leapt over the ocean to reach Lanka with his legs outstretched. Standing splits is best done after some prior lengthening and warming of the hamstrings and calf muscles, and a little hip opening. It’s also a useful pose to practice before you move on to hand stand, as the inverted position of the crown of the head towards the floor, combined with one leg being as high in the air as you can reach it will begin to build a sense of balance and trust as you find yourself getting used to being almost upside down. There’s another, more subtle element to this posture though…. 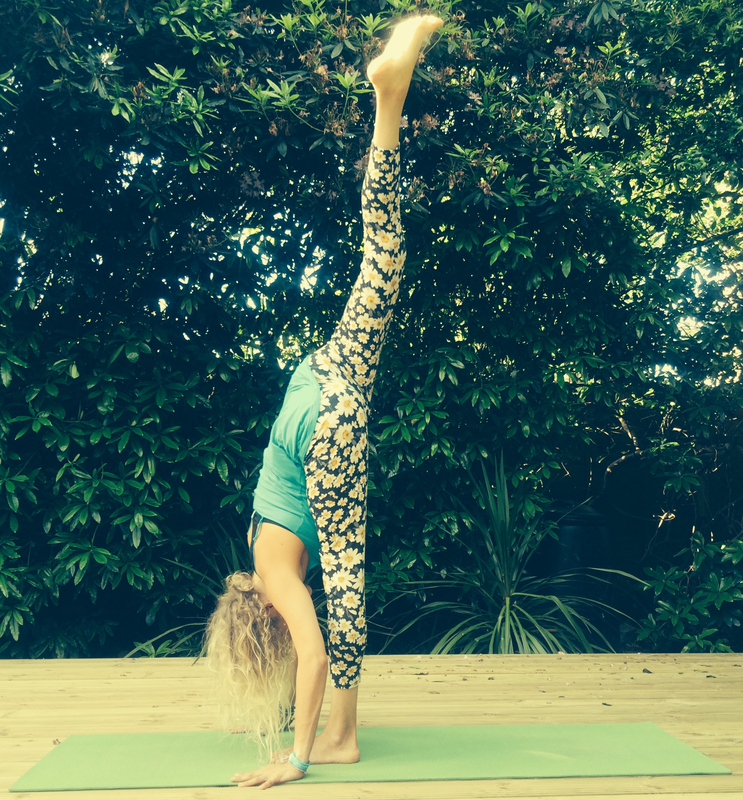 It’s the ability to apply a little Satya (or ‘truthfulness’) to your standing splits…. Allowing the hip to open as you enter the posture will result in being able to lift the leg a lot higher, and is probably how most of us might practice it if we’re moving through the posture in a flow-style class…. But as we know – it doesn’t matter what the posture looks like, as yoga isn’t just about making shapes and being super bendy…. Consider applying this ‘truthfulness’ to your practice and you may be dismayed to notice your leg doesn’t reach up so high any more, but you’ll be creating more strength and stability around the hip and pelvis instead of forcing an imbalance in to the vulnerable joints of this area. You’ll also be working your way towards properly opening and lengthening the body in preparation for the full Hanumanasana. So, when you extend the leg up to the ceiling, keep the hips level, resisting the temptation to twist and open one hip out to the side. Move through your surya namaskars at a moderately rapid pace to generate some internal heat and ease through the muscles – of course remaining mindful of each movement no matter how ‘fast’ you move. Practice virabhadrasana 1 and parsvottanasana to focus upon warming up the legs and bringing those hips to equally face forwards. Virabhadrasana 2 will aid in opening through the hips and thighs – especially the adductor muscles and hip flexors, and moving into Trikonasana can help in lengthening the hamstrings and calf muscles a little further. To warm and further lengthen around the hips and hamstrings, move slowly between lizard pose and ardha hanumanasana (half splits). Flexibility doesn’t come when we stay rigid and still and attempt to force a ‘stretch’ – it comes when we move gently and fluidly, with a relaxed mind. This ‘relaxed mind’ sends a message to the body that it’s ok to relax and let go of contracting and ‘defending itself’ against our persistent pushing, making poses which require a little more flexibility a lot easier. From here, concentrate on first of all BREATHING! When we find things difficult, we have a habit of holding our breath, which starts to send out warning signals to the body – deep and conscious breathing keeps the body and mind at ease. Secondly, focus upon bringing your hips parallel with the floor. As you exhale, bring the hands or fingertips to the floor in front of you – as you find more balance, walk the hands in closer and closer to the standing foot. From here, press your standing foot firmly into the floor, letting go of ‘gripping’ with the toes – instead focus on grounding through the heel, little toe and big toe joints of the feet. This firm grounding can allow for a sort of ‘upward thrust’ through the body, as the two opposites of pressing down and lifting up work together to lift the top leg up. As you inhale, lift the top leg up to the sky – notice if your hip starts to open and continue to bring those hips parallel. It may not please your ego quite as much, but having the leg lower and choosing not to open out the hip assures healthy alignment here. Imagine those helium balloons lifting the top foot up as you continue to release the crown of the head towards the floor. If you have a tendency to jut the chin out as we observed last week in our practice of dhanuarasana, ever so slightly tuck it to keep the back of the neck – and therefore the spine – lengthened. Stay here for 5 to 10 breaths. *Note that if the place you are practicing in is particularly warm, you may feel more flexible due to the external temperature allowing the body to lengthen and open much easier, so it’s even more important here to maintain mindfulness – especially of the upper attachment of the hamstrings (which is around the underneath of the buttocks for a quick and easy reference) and to not over stretch any muscles. If it’s a full moon (which it happens to be on the particular day I’m posting this article), lunar activity changes our body’s balance of water – just as it effects the sea and the tide – and can make us feel a little more flexible too, not to mention slightly more wobbly! This is just one of the reasons Ashtanga practitioners will not practice yoga on ‘moon days’ – i.e. when there is a new or full moon, so be aware of this if you feel unusually flexible or un-balanced today. To transition out of the posture, place the top foot next to the standing foot and come in to uttanasana (forward fold) with the legs slightly bent, before moving on to the other side. To counterpose, sit in virasana (hero’s pose) for a few breaths, and then move on to bridge pose to bring some stability and engagement back to the muscles we’ve just lengthened and opened. ← Thoughts on the Thyroid….